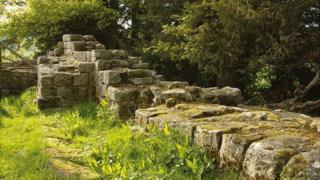 Illegal treasure hunters have damaged part of Hadrian's Wall, experts claim. So-called nighthawk metal detectorists are blamed for more than 50 holes found around the 1,900-year-old Brunton Turret section, near Hexham, Northumberland. Historic England said those responsible were searching for loot such as Roman coins and military regalia. Other areas of the ancient wall, a World Heritage site, have been targeted. The Brunton Turret section of the wall was built by the Twentieth Legion of the Roman Army. Is 'nighthawking' stealing our past? Historic England said it was working with police to try and find those responsible. But it added it was not practical to install security measures like CCTV along the stretch of the wall. The 73-mile (117km) wall stretches between Wallsend in North Tyneside and Bowness on Solway in Cumbria and has about 160 scheduled monuments, which include Roman camps, forts and signal stations. Anyone using a metal detector without authorisation on these sites is committing a criminal offence. Historic England wants visitors to Hadrian's Wall and Tyne Valley residents to report illegal metal detecting which is "causing loss and damage to our shared cultural heritage". Mike Collins, the organisation's inspector of ancient monuments, said: "We know that the majority of the metal detecting community complies with the laws and regulations regarding discovery and recovery of objects from the land. "But the small number of people who steal artefacts and damage ancient sites are breaking the law and robbing us all of the knowledge and understanding that objects from the past can give us." He said the majority of items taken were sold on, some via online auction sites, with others being bought by individual collectors. Mark Harrison, head of heritage crime and policing advice for Historic England, added: "We may never see or fully understand the objects taken or damaged because they have been removed from their original sites with no care or record as to their history or context. "Historic England will continue to work with Northumbria Police, the Crown Prosecution Service and the metal detecting community to identify the small criminal minority who are intent on causing loss and damage to our shared cultural heritage and to bring them to justice."